What an Investor Need to know before Investing about Asset Classes? Making the right investment plan is an interesting way to multiply an individual’s savings. How well the planning could be done? From where should it begin? How is going to grow? Isn’t it very curious to make money multiply? Read ahead to know where to start and how to go ahead with your investment planning. 1. The time period you are intending to invest your money. 2. The level of risk you are ready to take with your money. Investment planning using different asset classes requires making decisions based on your risk tolerance. If you wish to take more risk and need more returns in spite of market risk, then go for equities or stocks . Instead you may want a constant return of money even though the return may be low. In such a case Fixed Income Instruments may be the better option. 3. Choose the right product after analysing each one of them well. Hence, it is important to learn about the different asset classes available in the market. Knowing in detail about the asset classes helps in planning asset allocation meticulously. 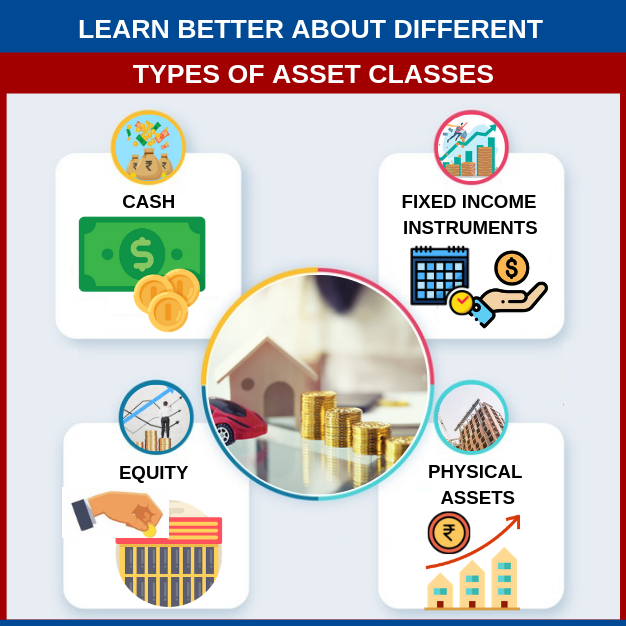 Based on the investment objective, let us now learn more about asset classes.An asset class is a group of investment options that have similar characteristics but are individually unique. Sometimes, specific characteristics may overlap but still each asset class is unique. Neither any asset class can be a perfect substitute to another not we can compare one over another. For example, nowadays, we have different options available to cook. Right from kerosene stove, gas stove, hob to microwave oven and many more. However, we cannot compare one over another as each product has its own advantages and disadvantages. Asset classes are like the building blocks of a good investment strategy. No asset class can be defined as ‘right’ or ‘wrong’ to invest. It is all based on the investor’s objective and needs and preferences. Pros and cons of each asset class needs to be investigated before investing. Let us look at some of them individually. Cash can be the physical currency or the cash in bank which is available for withdrawal at any needed time. If the investor needs money back quickly and cares only for the principal, cash is the safest option. Cash has safety and liquidity. For example, in case of emergencies like hospitalisation, cash will be required immediately and you need not wait to gather your resources. But, with the growing inflation rate and lower interest rates,the return is also lower than other asset classes. Instruments like bonds, securities that yield fixed or periodic income come under this category. These offer steady growth of principal. The security will be high and the right option for those who has low risk tolerance. One can invest in debt mutual funds to invest in a diversified debt securities. About the cons, one can get the returns after a long period where money is kind of locked. Investing in equities, stocks of companies, yield higher returns over long periods. You can invest in equities directly or through equity mutual funds. They are easy to liquidate. Also, it has the potential to beat the inflation. Whereas investing in equity requires a very strong expertise, as little knowledge of it may end you up in high losses. Equity prices are prone to wide fluctuations leading to losses, forcing the investor to sell at the wrong time. Also, slumps in equity market may last for a long period. The investor may opt to invest in physical assets also. Investing in real estate will be a good bet. This class gives a psychological comfort of safety. It fetches good returns in the long period. But valuing real estate is hard, requires expertise employed before investor is buying value for his money. Huge amount of money needed (affordability) to invest, sometimes goes beyond affordable limit. This may restrict investments in other classes. High maintenance will also be required. Also, it has a very less liquidity. There are other asset classes available in the market like gold, commodities, and collectibles. Asset classes are wide and varied. No single asset class will meet your requirements. Only a combination of these asset classes covers most needs and goals . “If a man empty his purse into his head no man can take it away from him because an investment knowledge always pay the best dividend.”― Benjamin Franklin. Knowing the asset classes gives you the ability to choose among them. This helps to allocate the money in different asset classes wisely, based on your investment objective and grow the return the way you need. Next Next post: Is your financial plan really practical and workable?